River Cruise or Ocean Cruise . . . Which Should I Choose? River Cruise or Ocean Cruise . . . Which Should I Choose? Well, it depends on what you are looking for doesn't it. They both visit interesting places and they both provide great food. So what is the difference besides on is on an ocean going ship and the other is aboard a river cruising boat. ﻿ Today’s ocean-going cruise ship has it all: rock-climbing walls, water parks, ice skating, up to 20 different dining venues for your enjoyment (virtually all at an added cost), accommodations that range from small and basic to large and opulent. An ocean cruise more like a Vegas-style vacation than a cruise. In fact when I started selling ocean cruises one of our selling points was that almost everything was included in the fare price. Over time something has happened to the all-inclusive nature of an ocean cruise, namely it has all but disappeared. I must say that there are a few small high end cruise lines that are experimenting with going back to being all-inclusive but at a high price. However, generally you can expect to be "nickeled and dimed" to death on an ocean cruise. You will have the choice of many dining options but for most of them you will pay an extra charge from $15 to $50 per person. Shore excursions are plentiful but only at an added fee. To be honest when someone tells me they can get a seven night cruise for $499 per person I just smile. You see I know that that $499 seven night cruise is actually going to cost the about $900 or more per person by the time the nickle and dimming is done. On an Ocean cruise you will find yourself queuing up for just about everything. After all you are sailing with up to 4,000 of your closest non-friends. Most cruise ships are crowded and rushed unless you ferret out some hide-a-way where you can get some respite from the crowds. Now don't misunderstand me. I love ocean cruises and I have been on plenty of them with a wide range of cruise lines from Carnival to Cunard and any number of those in between. I intend to experience many more before I am done. They offer a great product but you need to understand how it all operates. Ocean cruising is not as inexpensive as their fare prices might lead one to believe nor or they the luxury vacation they once were. Additionally an ocean cruise will take you places a river cruise cannot. You'll not find any Caribbean islands on a river cruise itinerary. There is something about going down to sea on a ship. The open sea holds a wonderful fascination for us. I know that I love standing on the bow with the sea air blowing in my face. I suggest that if you are under 40 and have never cruised that you start with an ocean cruise and that you do so on one of the cruise lines that offer the Vegas style vacation (Royal Caribbean, Carnival or Norwegian). This is the one group that will probably enjoy an ocean cruise the most. ﻿﻿﻿﻿﻿﻿﻿﻿﻿ Cruise lines like Viking, Avalon, and Uniworld on average offer boats that only accommodates 130 or so guests and quest rooms are well appointed with every conceivable amenity. As we said above, the food is world class with much of it prepared al carte at the time you order. Wine, beer, soda and bottled water are all complimentary. You will find that small-group sightseeing excursions are also included in every port. All of this facilitates your having a cruise experience that will produce a lifetime of memories not only of the places you have seen but the people that you have met. So back to my original question, "River Cruise or Ocean Cruise . . . Which Should I Choose?" As you can see the answer to that question begs the answer to another question of equal if not greater importance and that is, "What kind of cruise experience do I want and which one of these will come nearest to giving me that experience?" By the way, you don't have to travel half way around the world for a great River Cruise. 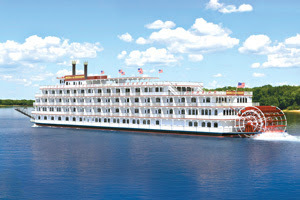 You can get a great River Cruise vacation right here in the USA. American Cruise Lines probably has a great river cruise within driving distance of your home. Have you been on a river cruise? Why not share your experience with others? Done both a river cruise and an ocean cruise? Which did you enjoy the most? Why? Tell me what you think.